A Rain of Frogs > 1...2...3...cat...sank! The kids call the little marina down on Lakeshore south of us ‘the Glass Beach’ on account of all the worn pieces of glass we picked up there. They had been washed up by the constant motion of the water. While riding home from work last week, I was surprised to find that one of the boats had sunk on it’s mooring. I had my iPhone, and took pictures that I posted to Facebook, but the lack of a zoom made for pictures that didn’t do the tragedy any justice. 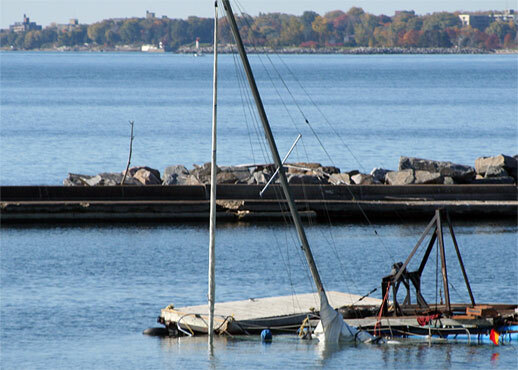 So while we were driving by on Lakeshore the other day, I snapped this photo of the poor boat. Truly a sailors worst nightmare.